According to an Australian gaming researcher, pets can be just as enthusiastic and habitual gamers as humans. RMIT University’s Professor Larissa Hjorth has taken special interest in mobile gaming, and gathered many ethnographic case studies from the Asia-Pacific region, which she compiled in a book in 2009. One of such studies, a three-year investigation of mobile gaming in Australian households, revealed that cats love to join in when their owners sit down for some quality gaming time. Hjorth says the researchers were surprised to discover this, although if YouTube archives of cats playing iPad games are any indication, this stuff has been going on for a while now. However, they point out that the interesting aspect here is the fact digital gaming applies to socialisation with pets as much as it does when we think about human interactions with games. 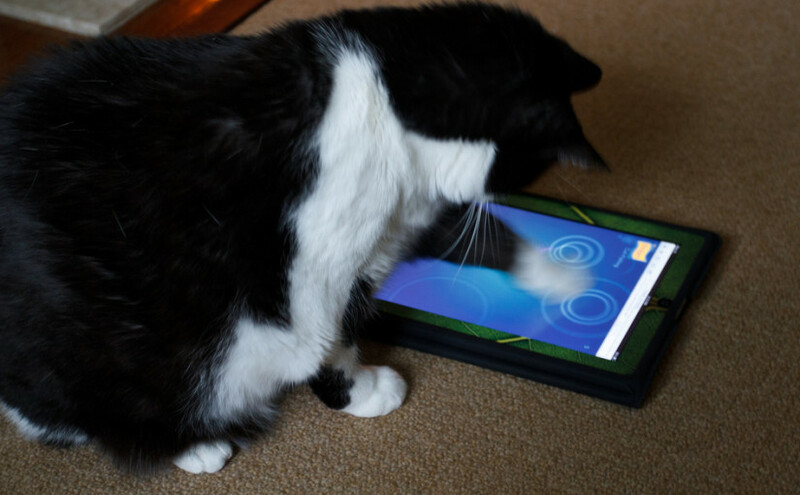 I think it makes sense – cats need a lot of play time, and if they can bat around a ratty synthetic mouse, why not bat at digital fish on a screen? I think it would be more interesting to find out whether cats enjoy tapping on imaginary mice as much as they love ‘real’ pet store specimens. However, given the limited abilities cats have for self-reporting their moods on questionnaires, I don’t know if we’ll find out until some kind of human-cat speech translator has been invented. So, perhaps never.